A few months ago I set out on a series of articles through which I am scanning the history of the church—from its earliest days all the way to the present time—to examine some of Christianity’s most notable false teachers. Along the way we have visited such figures as Arius, Joseph Smith, Ellen G. White, and Norman Vincent Peale. Today we turn to one of the most outrageous charlatans of our time, a man who claims to have healed countless people. His name is Benny Hinn. Toufik Benedictus Hinn was born on December 3, 1952 in Jaffa, Israel (modern-day Tel Aviv), the son of a Greek father and Armenian mother who had immigrated from Greece. He was raised in the Greek Orthodox tradition but educated in Roman Catholic schools. After the Six-Day War, he and his family emigrated to Canada and at the age of nineteen he professed faith in Jesus Christ. He immediately became involved in the Pentecostal movement in Toronto and was mentored by Dr. Winston Nunes of Broadview Faith Temple. In December 1973 Hinn traveled with other Christians to Pittsburgh to attend a miracle healing service led by Kathryn Kuhlman, the foremost faith healer of that day. Though Hinn never met Kuhlman personally, she left an indelible impression on him, and at that service he had a life-changing religious experience. Shortly after, he received a vision of people falling into a roaring fire and heard the words: “If you do not preach, every soul who falls will be your responsibility!” Later that year he began to preach and claimed that at this time God miraculously cured him of a terrible stutter. He soon began to imitate Kuhlman and even to sponsor services endorsed by the Kathryn Kuhlman Foundation. In 1979 Hinn moved to the United States of America, settling in Orlando, where he met Suzanne Harthern, a pastor’s daughter who would become his wife. In 1983 Hinn founded Orlando Christian Center and began to perform miracles and conduct healing services, claiming that God was using him as a conduit for these supernatural deeds. Soon his “Miracle Crusades” were being held around the world and, by 1989, were being televised across America. The daily talk show “This Is Your Day” followed, and is now broadcast in over 200 nations around the world. In 1999 he handed the leadership of Orlando Christian Center to Clint Brown so he could focus entirely on travel and crusades. Millions, or even tens of millions, attend his crusades each year. The largest event to date took place in Mumbai, India, where over seven million people attended over a three-day period. He claims to have preached the gospel to over a billion people, either face-to-face or through television. In recent days Hinn has been the subject of scrutiny on a number of fronts. In 2010 his wife filed for divorce citing “irreconcilable differences.” This was shortly after the National Enquirer published photographs of Benny Hinn and fellow televangelist Paula White walking out of a Rome hotel hand-in-hand. However, nearly three years later, Benny and Suzanne were remarried at The Holy Land Experience theme park in Orlando. His claims of miracles remain unverified despite a host of programs and publications that have looked for evidence. He has also been widely criticized for his lavish lifestyle, which includes a private jet, a multi-million dollar mansion, and regular stays at hotels costing thousands or tens of thousands of dollars per night. This extravagance led to United States Senator Chuck Grassley announcing that the United States Senate Committee on Finance would be investigating Hinn’s ministry. Critiques of Benny Hinn can span a multitude of areas—his Word-Faith theology, his “little god” theology, his claim that each person of the Trinity is actually his own trinity, his outright lies about his accomplishments, and much more besides. But for our purposes, we will recognize him as the world’s most recognized faith healer. Hinn teaches that God intends for everyone to be healed of all of their diseases. If people simply have the faith to believe they can be healed, God will heal them through the agency of a healer like himself. Hinn’s crusades are carefully constructed to lead and manipulate those in attendance, with singing and repetitive music that build a particular atmosphere and sense of anticipation. These crusades crescendo in a time where he announces that God has begun to heal people and he then invites those people to come to the stage to tell what God has done, a technique that was mastered by Kathryn Kuhlman and has since become a staple of faith healing. Hinn claims that God is working powerfully through him to heal others and begins to list those miracles, usually starting with ones that are invisible and unverifiable at the moment—diabetes, depression, and the like. As the healings begin, many people come forward, hoping for their own miracle. Generally, though, only people who claim to have already been healed are showcased on the stage where Benny speaks to them and then often “slays” them in the Spirit. In this way he has manipulated countless people to give money to his cause, believing that giving money will be key to activating their miracle. Not a single one of Hinn’s miracles has ever been verified, though many have been proven to be temporary or false. Hinn’s television show “This Is Your Day” is broadcast around the world and remains regular viewing for millions. He speaks to millions more each year through his crusades. He has also perfected faith healing techniques that have been imitated by a host of others. He is the world’s best known and most notorious faith healer. While the Bible clearly presents a God who is capable of healing and a God who at times does heal miraculously, it never tells us that it is always God’s will that we be healed. In fact, it may be God’s will that we suffer for a time. Never does the Bible tell us that our healing is dependent upon the quantity or the activation of our faith. And most Christians hold that even while God does still heal people today, he no longer does so through the agency of a healer (see James 5:13-16 and read about A Presbyterian Healing Service). Hinn’s theology of healing is laid out in his book Lord, I Need a Miracle. 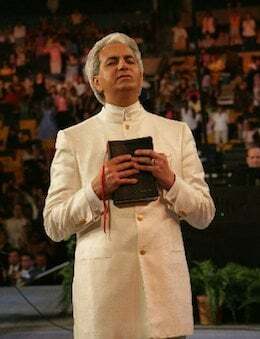 Richard Mayhue points out eight grave errors: Benny Hinn holds it is wrong to pray “Lord, Thy will be done” even though Jesus Christ did (Luke 22:42); Hinn believes that God always intends for believers to be healed, even though some great saints of the Bible were unhealed (the apostle Paul among them); Hinn teaches that believers should command God to heal, while the Bible instructs them to ask (1 John 5:14-15); Hinn suggests that miraculous healing from God is gradual, while the miraculous healings of the New Testament were instantaneous; Hinn teaches that faith on the part of the sick person is essential to healing, while a man like Lazarus could not have exercised faith when he was healed since he had been dead; Hinn believes that we must do our part before God can heal, while the Bible teaches that God is sovereign; Hinn believes that Christians should not be sick, while the Bible teaches that Christians can be sick and will all eventually die; Hinn implies that a person’s healing can be lost and that the healed person must do certain things to keep the healing, while such a notion is completely foreign to the Bible. In the final analysis, Benny Hinn is a dangerous deceiver, a fraud and charlatan who enriches himself at the expense of countless others.